It's a ranking of the geographic size of cities in New York State. The numbers are from the US Census Bureau (which lists the areas in square meters). The rankings do not include the state's towns and villages. What's the difference between a city, town, and village? Good question. Here's a quick explanation. Did you know: There is no minimum size -- geographic or demographic -- for a city in New York State. We picked Albany because it's a place with which most people around here are familiar, and NYC and Mechanicville because they're the biggest and smallest. Cities in the Capital Region's four core counties are marked in blue. There's a clickable map of all these cities at the top of the page -- scroll all the way up. + That NYC is the largest isn't a surprise. But nowhere else in the state is even close. + Look at Rome representing in the #2 spot. Wouldn't have expected that out of the CNY city. We would have guessed Syracuse and Utica were both bigger CNY cities than Rome. Bonus bits about Rome: It's said to be the site of the nation's first cheese factory. + Another surprise (for us): Saratoga Springs in the top 5, bigger than Syracuse and Albany. 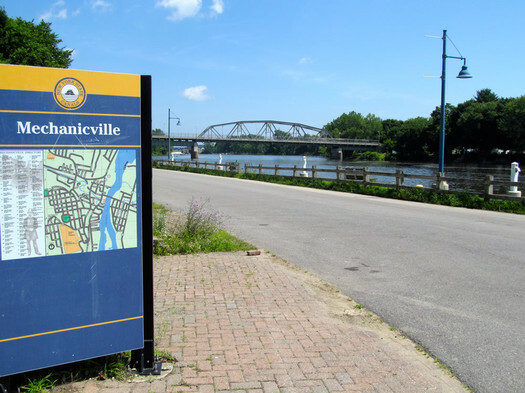 + As it turns out, the Capital District has the two smallest cities in the state -- Mechanicville and Watervliet, which is just 1.35 square miles. And Cohoes (#51) and Rensselaer (#53) are toward that end of the scale, too. Hey, all you New York State cities, listen up. I want you to line up in size order, ya' hear? Right now. Move it. Hey you, over there in the corner. Yeah, you. What's your name? Mechanic-what? Mechanicville? OK, Mechanicville, stop goofing off and get in line. And I don't care if you're the smallest city. In line now. Hey, Mechanicville. THIS end of the line! And you over there, big guy. What's your name? New York City? Listen here, New York: I don't want none of your lip, see? You talk back to me once, an' I'll send ya' over to New Jersey for the day. Front of the line, New York. And what's going on over here, Saratoga Springs? Put down that racing form and get in line now. Yeah, I'm talking to you, fancy pants. And, Oh, Albany! Stop schmoozing with New York and straighten up, now. Albany should have annexed Renrensselaer. Troy should have annexed West Troy, Watervliet. Consolidated Services for the win. Love the idea of Mechanicville as a unit of measure. Brilliant. Perhaps we can use it to replace hectares or something else we really don't use any more. Also love that you went to four significant digits -- I respect serious mathematical dedication to a pointless exercise! Rome is a bit of a cheat -- it's because it includes the enormous Griffiss Air Force Base, with a runway that is more than two miles long. How many cities did Rome have to snuggle up to to get that high up on the list? Now I'm feeling prouder of my five mile runs around Troy. I'm seeing more of the city than I thought I was! The reason Rome is so big in area is because of government consolidation. It has an inner city and an out city boundary, much like Saratoga Springs. The inner city is the main part of the city where most of the residents and businesses are. The outer city is what actually was the former Town of Rome. The outer city is actually pretty much like any town in Upstate NY, farmland. As a native "Mechanicivlllian" and "map nerd" that now resides in the NYC metro area, I can really appreciate this. I'm sending this to all of my downstate co-workers/friends, thanks!